Political Players is a weekly conversation with the leaders, consultants, and activists who shape American politics. This week, as the Democratic contest heads to West Virginia, CBS News' Brian Goldsmith talked with Gov. Joe Manchin about Tuesday's primary and the future of the race. CBSNews.com: Governor, your state is obviously holding a primary next Tuesday. Senator Clinton is heavily favored. But do the results even matter at this point? Gov. Joe Manchin: Oh, absolutely. I truly believe so. And it's an exciting time to be a Democrat in the United States of America. And we have so many of them here. They're all excited about our primary. Myself, I'm up in the primary election. So, we're all geared up for this. And having both of the candidates come to West Virginia adds that much more excitement to it. CBSNews.com: You've remained neutral in the contest between Clinton and Obama. As a superdelegate, will you vote for the winner of your state? Gov. Joe Manchin: I am inclined to do that. But I also wear two hats. I'm chairman of the Democratic Governors Association. And there are twenty-eight Democratic governors. Twenty-two have already committed. There are six of us still uncommitted. And if I can be in that position -- to do whatever I can that will help heal the wounds, and bring all of us back together for the most important thing we have to do, which is to win the election in November. But I wanted to definitely wait until the people in my state of West Virginia spoke on Tuesday and got to vote. CBSNews.com: But do you disagree with the consensus that Senator Clinton will win your state very comfortably? Gov. Joe Manchin: Right now, it looks that she has a strong support base and a strong advantage. Of course, you know, they're no strangers to West Virginia. President Bill Clinton spent a good bit of time here. He's been good to our state. And we've worked with him closely. And Senator Hillary Clinton has been here a few times herself. She's well-received and well-supported. Senator Barack Obama came two years ago and spoke to our Jefferson Jackson Day dinner and had a tremendous crowd. So we'll just have to see. But right now, it does look like it's favoring Senator Clinton. CBSNews.com: The Democrats, as you know, won West Virginia for a generation, up until 2000, and then lost again in 2004. And the voters who defected to the Republicans--mainly white, working-class voters--are exactly the people Senator Obama seems to be struggling with most. Do you think he has something to prove in West Virginia? Gov. Joe Manchin: Well, let me speak about both candidates, as far as what we'll identify as personal issues. One of them would be guns. That's a big issue in the rural states, in the states that have basically a culture and a tradition of teaching young boys and girls the joy of the outdoors and love of nature. It's so prevalent in this state. So, you know, we're very defensive on that. And the Republicans have been very good at getting people excited and worked up about these personal issues, if someone might take your guns, someone doesn't agree on your decision of a pro-choice or a pro-life position. Well, let me tell you in West Virginia, I'm a Democrat. And we have many Democrats in West Virginia that might not have the same philosophical belief on personal issues as some of our candidates, or both of our candidates. There's a lot of Democrats, myself included, who have supported right-to-life. I'm a lifetime member of the NRA. But I can assure you with all the checks and balances that we have in government, the candidate is not going to do that, whether it be Hillary or Barack, infringe on those personal issues and personal rights that you have. CBSNews.com: But are you concerned that there might be a relationship between Senator Obama's performance in the primary on Tuesday and his ability to carry the state if he's the nominee in November? Gov. Joe Manchin: You know, I sure hope not. And if Senator Clinton wins, or whatever the outcome may be on Tuesday, we all have got to work together. We've all got to be on the same team for the same purpose and cause, for the sake of the next generation to follow us, for the sake of the United States of America and really, for the sake of the world. We have an awesome responsibility to right this ship. CBSNews.com: What advice do you have for Senator Obama? What more could he do to reach out to the voters who are so drawn to you, but have not embraced him? Gov. Joe Manchin: I just think, you know, when we talk about a politician, I think a person has to be themselves. Let the voters see the real you. And you know, if you are what you are, and your beliefs and your desire and the passion, in West Virginia, like all these rural states, people have to see it and feel that passion, your commitment. My grandmother had a great saying. It always stuck with me: People don't care how much you know until they know how much you care. They've got to see it and feel it. And it's for real. And that's all. Be who you are. CBSNews.com: At what point do you think your party has to rally around a nominee? Gov. 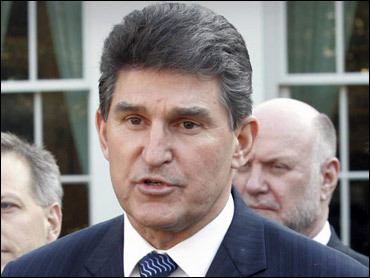 Joe Manchin: Well, everybody keeps saying the quicker the better. I keep saying that I believe with the excitement that's been going on, and the amount of new people we're bringing to the fold, they have to understand they're coming because they're excited about the changes that need to be made in this nation and our government, and the policies that need to be changed, and the different levels of leadership throughout the federal government, that needs to be turned over. You know, many of these campaigns have not been settled, when you look back in history, until the convention. But all of a sudden now, we've got to settle them six months before. And I'm not so sure I subscribe to that. So, it's just great to be a Democrat. A lot of excitement is coming here. It's the first time in West Virginia that anybody that's registered as an independent can go in and ask for a Democratic ballot and vote in our primary. 150,000 registered Democrats in West Virginia. And we'd like to see 100,000 of them show up for the primary. We have no clue what direction they're going. CBSNews.com: Do you oppose the pressure on Senator Clinton to get out? Gov. Joe Manchin: I think that's an extremely personal decision that her and her family, her husband and her daughter will make together. And I'm certainly not putting any pressure, nor do I think it's appropriate to do that. I think that when a person puts their heart, and soul and their resources for the period of time that she has done that, she deserves the leeway to make that decision on her own, with her family. CBSNews.com: And more broadly, what do you think about the tone and tenure of the campaign between these two candidates? Gov. Joe Manchin: Well I'm in a state where the super majority is Democratic. So, you can imagine, our primaries are hot and heavy, if you will. They're quite contested. And with that being said, this is not bad at all, as far as what we've seen. And I think they'll be fine. I don't think there's going to be a bit of a problem reuniting those two candidates behind the nominee when that happens. CBSNews.com: Finally, what more can Democrats do to learn from the lessons of 2000 and 2004 in West Virginia? What do the Democrats need to do to be more successful in your state come election day? Gov. Joe Manchin: Well I've evaluated this. You know, we have, in ten of the top states now, we have governors that are Democrats now, and not Republicans. And these governors are successful in the so-called red states. That means that they're crossing over party lines. And people appreciate the quality of service and the leadership they're giving. If I were a presidential candidate, I would go into those states, whether it be Ohio, in Virginia, in West Virginia, and the states that maybe in the last election or two that the Democratic governor has won, but on the national ticket they have not been able to do it. And I would ask that person to take the lead for me. Let's work together as a team. And we will give you the support on the national level. And I think I can best help us navigate the waters, so that people can hear the truth and see the real candidates. That would be my advice to any of them, either one.